Mirada Art Blog: Denver's Best Art Gallery: Mirada Fine Art! Denver's Best Art Gallery: Mirada Fine Art! 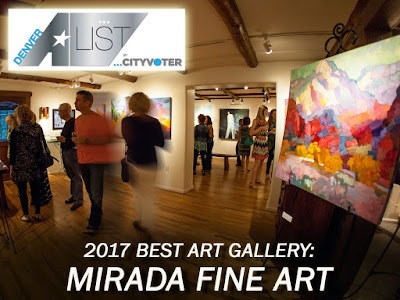 We're thrilled to announce that Mirada Fine Art was voted the 2017 'best art gallery' in the Denver metro area for the second year in a row. The Denver A-List competition just announced their winners, and this year there were over 70,000 over 148 categories. In the 'Art Gallery' category, there were almost 100 competing galleries, and Mirada Fine Art came out on top. If you voted for Mirada, thank you so much! If you would like to see all the results, go to the Denver A-List website. Cynthia Chartier at Mirada Fine Art!